As City Manager, it is my honor to serve the residents of Pasadena, working alongside the Mayor and City Council with a cadre of dedicated and passionate City employees to enhance the quality of life for all who live, work or visit here in Pasadena. This past year, our City moved forward in many ways and we expect that 2018 will again bring great things to Pasadena. Our 2017 Annual Report highlights many of our achievements from this past year, including award-winning bridgework and enhancements in public transportation services; and from celebrations of our arts and cultural heritage to advancements in protecting our environment. 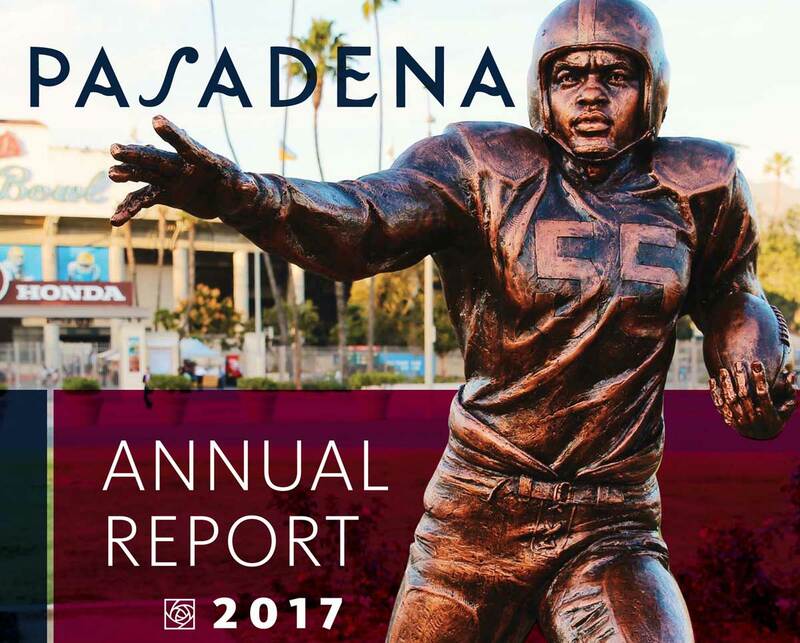 In 2017, we celebrated the unveiling of a beautiful statue near the Rose Bowl Stadium honoring famed athlete and Pasadena resident Jackie Robinson. We worked hard to provide more much-needed affordable housing and to improve the quality of early learning for our newest, and youngest, residents. We brought online a new, clean turbine generator at the Glenarm Power Facility for more reliable and environmentally responsible energy. We expanded our citizens’ preparedness for widespread emergencies and our abilities to use social media for better public communication. We continued to embrace the values and traditions that make Pasadena such a world-class, desirable place to live while also adopting new technologies to run our municipal organization as efficiently as possible. The City of Pasadena, however, is not without its challenges. While the City has rebuilt and, in fact, increased its General Fund reserves which were drawn-down to offset the impacts of the Great Recession, ongoing operating revenues are not growing sufficiently to offset the rising costs of providing municipal services, despite the positive national economy. In order to balance the Fiscal Year 2018 Operating Budget, more than $4.1 million was reduced from the budget through the elimination of vacant positions and reductions in operating budgets. The preliminary forecast for the upcoming Fiscal Year 2019 Operating Budget shows a deficit of approximately $3.5 million that will grow to more than $12 million in five years. The harsh reality is that the budget cannot be trimmed each year while service levels and programs remain at existing levels. Moreover, the projected operating shortfall is only part of the financial concern. Additional funding is needed for the repair, replacement and maintenance of the City’s aging infrastructure including Fire Stations, Community Centers, streets and sidewalks. I am convinced, however, that with the guidance of the Mayor and City Council, we will identify solutions to these challenges and ensure that Pasadena remains a premier city. I also remain strongly committed to ensuring Pasadena is run with efficiency and that we continue our proud tradition of providing excellent services and a quality of life that makes Pasadena a premier destination for business, technology, culture and tourism.